Publishers and retailers have a big challenge ahead of them. Users demand individual attention through 1:1 personalized user experiences in an increasingly noisy, crowded digital space. Scaling effective marketing efforts, converting traffic, and driving consistent engagement and loyalty isn’t easy. That’s why SparkPost and Boomtrain have teamed up to offer those users a best-of-breed experience by delivering 1:1 personalized emails. Boomtrain’s machine intelligence supercharges efforts to connect with the right customers, at the right time, using the content most likely to engage each individual. SparkPost’s industry leading email platform automates the assembly and delivery of individually tailored messages designed to arrive in the recipient’s inbox at optimal engagement periods. Reaching the inbox 98% of the time ensures that personalized messages will be delivered on-time and efficiently at scale. This integration also provides users a seamless experience to surface scalable recommendations and insights on an individual level. 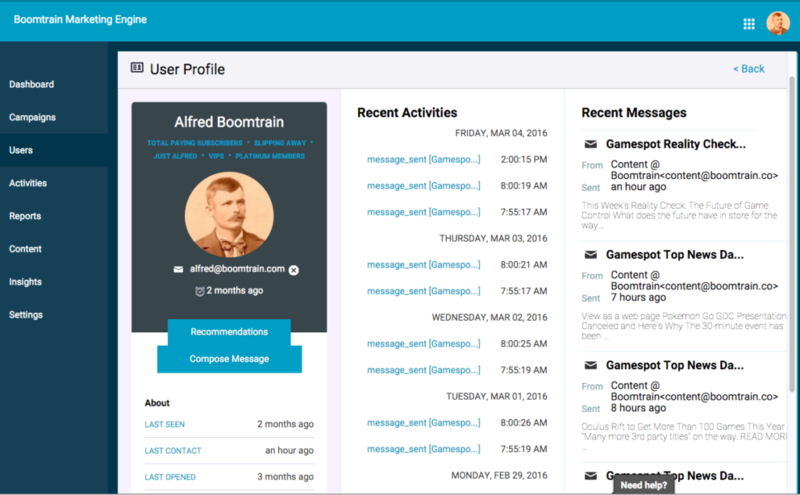 By coupling SparkPost with Boomtrain, the ability to reach each user across channels such as email, on-site, in-app, SMS, and push has never been easier. To learn more about Boomtrain, please visit their website. For SparkPost customers wanting a more in-depth demo of the Boomtrain solution, please contact our partner team for an introduction.